Neurons in the brain and spinal cord don't grow back after injury, unlike those in the rest of the body. Cut your finger, and you'll probably be back to using it in days or weeks; slice through your spinal cord, and you likely will never walk again. Now, working in mice, researchers at Washington University School of Medicine in St. Louis have identified some of the key steps taken by peripheral nerves—those in the arms and legs—as they regenerate. The findings, published the week of Dec. 10 in Proceedings of the National Academy of Sciences, lay out a path that neurons of the spinal cord might be able to follow—potentially leading to improved recovery for people paralyzed by spinal cord injuries. "We've figured out some of the events that are required for injured peripheral nerves to repair themselves, and we can see that these things fail to happen in the central nervous system," said Valeria Cavalli, Ph.D., an associate professor of neuroscience. "So now we're trying to see if turning on these networks can help spinal cord neurons regenerate." About 11,000 people in the United States survive a spinal cord injury every year. Such injuries most often are caused by car and motorcycle accidents, falls, contact sports and diving, or gunshots. Paramedics can reduce the risk of further damage by quickly and gently immobilizing the spine, but there's no way to reverse a spinal cord injury that has already occurred. The neurons that form the spinal cord do not spontaneously heal themselves. Neurons in the central nervous system—the brain and spinal cord—and the peripheral nervous system are very similar except in their ability to regenerate. So, Cavalli realized that studying peripheral neurons could help us understand why some damaged neurons regenerate and others do not. She turned to a unique kind of sensory cell that spans both nervous systems. Known as dorsal root ganglion neurons, these cells have long tendrils, called axons, with two offshoots. One branch of the axon connects to cells in the body's periphery and can regenerate if cut; the other side links up with cells in the spinal cord and cannot regrow after injury. Cavalli and first author Young Mi Oh, Ph.D., a staff scientist, and colleagues grew mouse dorsal root ganglion neurons in the lab and then cut them to find out what biological processes occur as the cells regrow their axons. They also cut the sciatic nerve—which runs up the leg and into the spinal cord through the dorsal root ganglia—in mice. The researchers then identified a suite of genes needed to be turned off for the axons to regenerate. "Other people also have shown that a big swath of genes is turned down during regeneration, but as a field we've just said, 'Eh' and ignored them to focus on the genes that are activated," Cavalli said. "Here, we showed that establishing a regeneration program means some genes have to be turned on but a lot have to be turned off." In particular, a set of genes related to sending and receiving chemical and electrical signals—the primary duty of mature neurons—had to be silenced for the injury to heal, the researchers showed. "The injured neuron has to stop functioning as a neuron and focus on repairing itself," Cavalli said. "This means the neuron has to transition back to an immature state so it can re-engage developmental programs and regrow." 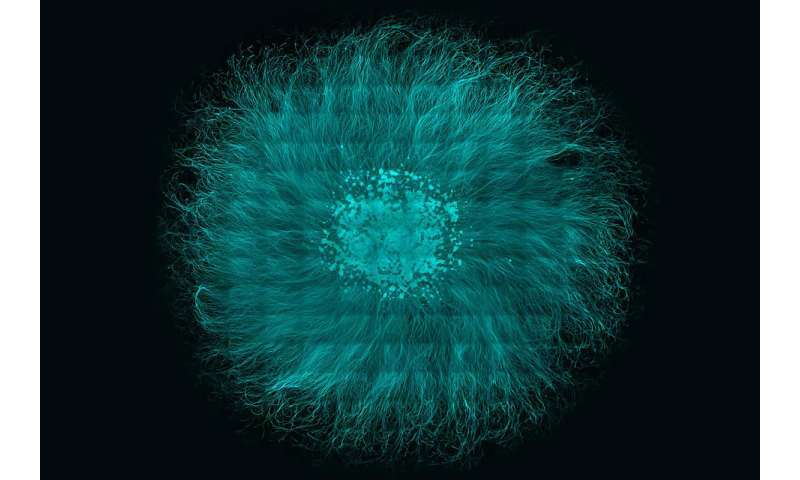 The idea that cells must become less mature in order to regenerate is not new, but Cavalli and Oh's study provides evidence in support of that idea. The researchers identified the key molecular and genetic players involved in regressing to a less mature state, and showed that the timing of the regression was crucial to successful recovery. "If you're triggering a system that makes the neuron less mature, you have to make sure it's not forever," Cavalli said. "It has to remain a neuron, albeit an immature one, so it can re-mature and start functioning again after it repairs itself." "We haven't found a cure, but we have a better understanding now of what injured neurons do," Cavalli said. "From here, we can build new hypotheses and work toward applying them to people." For someone with a rebuilt neck and further back injuries, news like this is encouraging, although may be too late for me, personally, seeing others NOT have to go through the same hell would be worth it. I do have some years left, so I hope that this and other treatment options make it possible to do work on a back that is already attacked with arthritis, as well as fractures, spurring and stenosis and badly degraded discs like gravel in leaky sacks, so ANY good news about nerve and disc regeneration in the spine is good to hear.